Hong Kong’s Art Week will reach new heights in 2015 with the launch of the inaugural Art Central, the first satellite fair of international standards to be staged in Hong Kong. From 14 to 16 March 2015, Art Central will welcome the art-loving Hong Kong public alongside an international audience of buyers, curators and art enthusiasts to a vibrant and fresh new event in the Art Week calendar. Art Central is timed to complement Art Basel and the growing popularity of Hong Kong Art Week, positioning the city firmly as one of the world’s leading art hubs. Art Central takes place on the new Central Harbourfront in a 10,000 square metre temporary structure, the likes of which have not been seen in Hong Kong before. This enviable location on Victoria Harbour will make a bold statement on the Hong Kong skyline. Art Central is brought to Hong Kong by the team behind ART HK, which went on to become today’s Art Basel. Tim Etchells, Sandy Angus and Will Ramsay, founders of ART HK, and Charles Ross who was Managing Director of ART HK will be overseeing the new fair. In combination they deliver a wealth of experience and a thorough understanding of the demands of staging a sophisticated art fair from their previous fairs which are staged around the world. 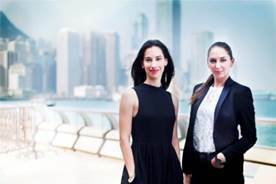 Art Central will be headed by Fair Co-Directors Eve Share Banghart and Maree Di Pasquale who bring impressive global art fair experience to the team. Eve Share Banghart joined ART HK in 2009 and went on to become Gallery and Project Manager for Art Basel. Maree Di Pasquale is the former Melbourne Art Fair Assistant Director, having previously worked on the launch of Sydney Contemporary. “Satellite fairs are an integral part of Art Week in global art hubs such as London, Paris and Miami. Art Central lifts Hong Kong Art Week to an international standard; we’re getting ready to rival the world’s best,” said Eve Share Banghart. Art Central will feature over 70 galleries from Asia Pacific and the world, and will present contemporary work from both established artists and a range of newer talent. The fair has a dedicated emerging section entitled ‘Rise’ which will showcase both solo and dual artist presentations from spaces launched in the last five years. Art Central has appointed an impressive gallery selection committee comprised of Ethan Cohen of Ethan Cohen Fine Arts, New York; Conny Dietzschold of Conny Dietzschold Gallery, Sydney and Cologne; Angela Li of Contemporary by Angela Li, Hong Kong; and Christa Schübbe of Schübbe Inc., Düssledorf. Stiff & Trevillion, award winning London architect firm and former architects of ART HK, have been appointed fair architects. The fair experience for Art Central will be completed by an ambitious programme of talks and panel discussions devised and presented by The Asia Society Hong Kong Center. Staged daily, the programme will provide a means for visitors to directly engage with some of the leading artistic trends and curatorial practices of contemporary art in Asia and beyond, including a panel discussion on contemporary ink art. Managing Director of Art Central, Charles Ross says, “We are thrilled to be launching the next big thing in the Hong Kong art calendar. Timed to coincide with Art Basel and the growing popularity of Hong Kong Art Week which annually attracts over 65,000 fairgoers, Art Central positions the city firmly within the first rank of global art destinations”. Full details of exhibitors and the supporting programme will be announced in early 2015.